Very often to bring a laptop with you, there are classical solutions in solid colors inspired by the male wardrobe. If you want something different this bag can give you a new idea. 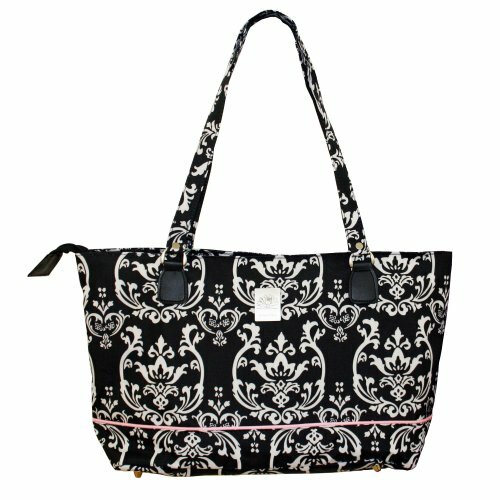 The tote (Jenny Chan 004-17-040–BBIN) in fabric has a black and white damask design. It has a detail in pink fabric that emphasizes the bottom of the bag. The handles are also made of fabric and are well fixed to the bag so as to ensure a good seal. It is fitted inside zip pockets and its external dimensions are: 18 inch x 5 inch x 12 inch, while those that contain the lap top: 17 inch x 2 inch x 10 inch.